Any bored graphics geeks out there? As Mr. Stoat suggests that this information might look good as a graph or chart, might anyone be interested in preparing it as such? The basic point is made here. Just how small the African economies are. So how about a map of England which assigns an African economy to a geographical area of England? GVA, which is a useful comparator to GDP, is listed for areas here. GDP for countries is listed here. PPP figures are probably the right ones to use. Note the difference between $ and £. The economy of South Africa is, for example, roughly comparable to that of London. $500 billion against £260 billion. Actually, the entire GDP of Africa (here) is about the same as UK GDP. Niger or Rwanda are about the same, individually, as Milton Keynes. The smallest unit that we measure in England and Wales is Anglesey. Which appears to be about the size, economically, of Djibouti, or of the Comorros, Sao Tome and Principe and a bit left over put together. This is obviously a project for a very bored graphics geek. But it would be an interesting thing to wave at those who insist that there should be no African free trade area. I was thinking of just a graph (logarithmic y-axis probably) which would plot economy size in sorted order for all the countries, then just add a few of the small towns you mentioned to make the point. I’m wondering about a pair of maps, UK and Africa. 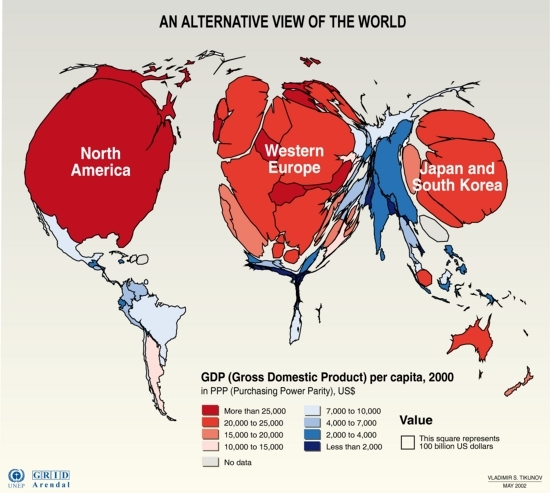 Relative sizes of maps scale to relative GDP. African map has countries scaled in proportion to GDP. If it is possible to maintain the outline so it is recognisably Africa, all the better. Then find yourself some key connections which are roughly in latitude lines (so SA-London is great, for example). Link ’em up with names and figures over the lines. Map of Wealth of Nations, 2002, from WorldMapper joint project by University of Michigan and Sheffield.